Rock Tumbler Instructions: How to use a rock tumbler? What Types of Rocks Can Be Tumbled? A Rock tumbler is a hobbyist dream machine. No, it doesn’t turn copper into gold, but it is getting close! It turns simple rough rocks into beautiful and lustrous stones. After that point, it is only up to your imagination what those shiny pieces can be made into. Make it the prime piece of a personalized jewelry gift, include it into home ornaments or use for other purposes such as in meditation and alternative healing. Now let’s have a closer look a wonderful machine! 1. What Is A Rock Tumbler? A rock tumbler is a machine used to smoothen and polish rocks. It is a popular item for hobbyists, jewelry lovers, craftsmen and lapidary enthusiasts and everyone who wishes to uncover the aesthetic value of rocks and minerals. Putting a rough and unpolished stone into the rock tumbler and watching it turn into shiny and lustrous stone is an achievement that’s worth the experience. Moreover, it’s a journey everyone can enjoy no matter the age. This is why rock tumbling can be made into a family activity for all. It is very exciting at each step from choosing the rock, checking measurements and other qualities that you look for in a rough stone and wondering how it will end up. After you gathered them all, stones you once ignored, until now, enter the barrel. After that the magic happens inside the tumbler machine, then presto, shiny rocks or crystals. They are now ready to be made into jewelry or other ornaments. 2. How does a rock tumbler work? Rock tumbler works by creating friction between the stones loaded into the barrel with water, and abrasive grit. The grit is the same material similar to that you’d see on sandpaper. Rock tumbling is a multi stage process which is uses different grits at each stage. When the barrel is loaded with rocks, water, and grit, it is then placed on a rotating motor or vibrating platform that tumbles the rocks inside. As the rocks tumble inside, the friction of stones grinding and the particles of the grit smoothens the surface and softens sharp edges. That’s the functioning principle of how the rock tumbler works. Now here is the grit of rock tumbling that rock aficionado’s abode by when tumbling their treasured finds. Stones colored crystals on a white background. 3. Rock Tumbler Instructions: How to use a rock tumbler? The first rule of the club of rock tumbling is you must read your tumbler’s manual. And the second rule is you must read your tumbler’s manual. Knowing your machine and the rules are essential to successful tumbling work. You should know how to operate safely and appropriately your tumbling machine. The manufacturer’s manual is the prime information source. Every device has limitations. Tumblers are no exception. Overloading the barrel is a common mistake among new tumbler users. Never load it with excess stones, water or grit. Check the load weight from your manual. Always start loading with the stones of advised weight and then add the grit and water. Double check the lid and make sure it has been sealed without any leakage. You can’t just fill the barrel with random stones. You should pick stones and check them carefully for a successful tumbling. After days of tumbling, you don’t want to see a barrel full of scratched stones and totally useless small pieces. Only pick stones with similar hardness and without any fracture or pore. A high-quality rough rock is the key to a high quality tumbled stone. If it’s low quality, then that would also yield to a low-grade stone. Eliminate fractured stones. Never include rocks with cracks and pores in your batch. Another mistake is not cleaning the tumbler’s barrel well enough. The left-over residues of previous tumbling stages will diminish your performance. Always clean the barrel and lid so that they will be ready for the next usage. Don’t fail to clean between the stages too. Failing to clean particles from previous processes will hurt your success. Don’t expect to receive your wonderful stones in 30 minutes. Give it the time it needs and your tumbler will give you the stones you imagined. Make sure that your tumbler barrel is clean and there is no debris left from the last time. Check the rim and the lid for grit, particles and rock fragments, keep them free of any debris to prevent leaks. Once you are sure that the barrel is ready start filling it. The load should reach around 70% of the barrel with stones, grit, and water. If you can’t fill the barrel up to that level, the result will be bruising of the rocks that affect quality. Use a mixture of large and small stones. The little stones will help in getting a better and faster result. If you don’t have smaller rocks to combine with larger pieces, then add an alternative such as ceramic media to reach up to necessary level. Rock tumbling is a 4-stage process where we use different grit at each step. An additional finalizing step may be appended called burnishing if needed. What is burnishing in rock tumbling? Sometimes, after the fourth stage, there are stones, which look a bit cloudy. This is mainly due to small particles, which got stuck in cavities. This undesired look can easily be corrected by tumbling these rocks for a few hours with soapy water. After this burnishing phase, you’ll have your stones shiny just like the rest, and they are now ready to become a piece of a jewelry item or other unique items. 4. What Types of Rocks Can Be Tumbled? Hobbyists find tumbling rocks to be satisfying, turning what looks like an ordinary rock into something beautiful; the challenge of finding the potential in something to turn into a lustrous and shiny stone. 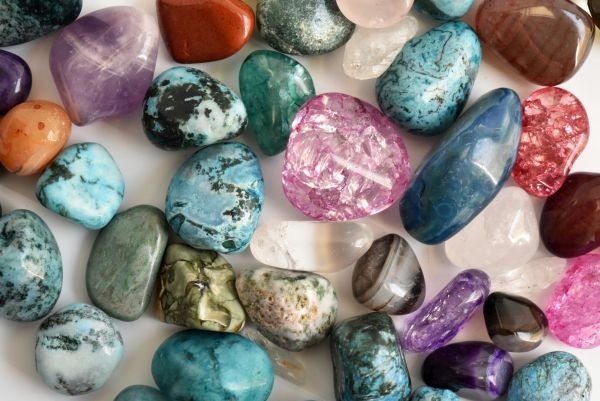 Most tumbled stones are turned into jewelry, ornaments and used for other purposes such as meditation and alternative healing. 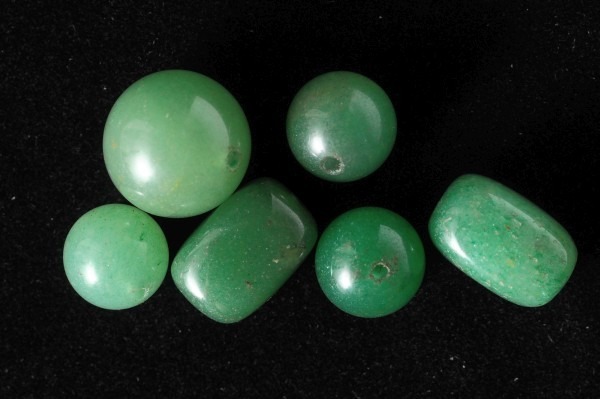 Many tumbling kits provide different types of rocks and raw gemstones. As you continue with the hobby, you’ll come to develop the eye to look for stones. This actually adds to the satisfaction. 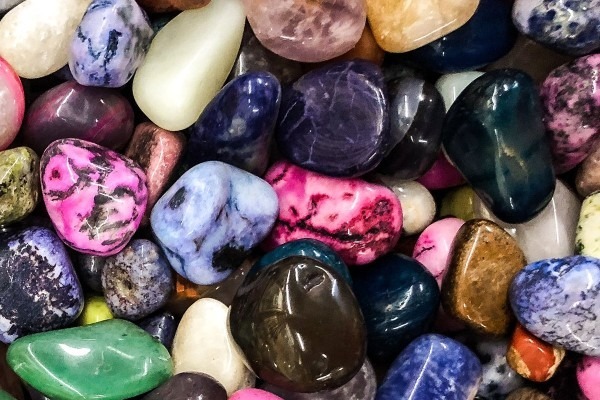 The best rocks that can be tumbled and turn into fine crystalline pieces are Agate, Jasper, and Quartz. The characteristics you look for in raw stones are hardness, density, and smoothness. The best rocks for tumbling must be very hard but not too hard as they will take very long to tumble and soft ones will not polish well. They should have the hardness that’s between 2 to 5 on the Mohs hardness scale. 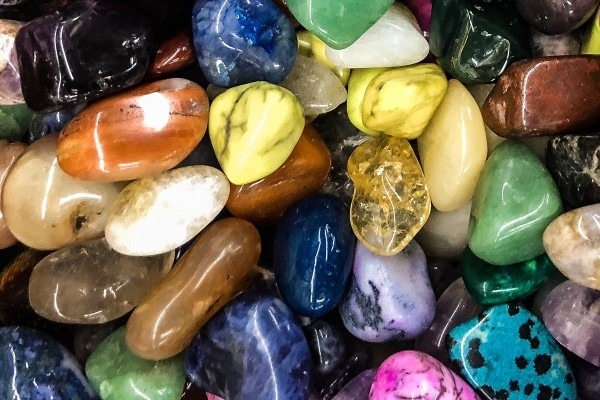 Density is important as porosity in stones can lead to grit particles getting into the crevices or tiny pores and will not produce good polish. Fractures can result in breakage while inside the barrel. A quality rock does have a smooth surface making it easier to achieve a flashing result.